The family is found in the 1830, 1840, and 1860 US census records. They are nowhere to be found in 1850. I have tried every variation of names and possible locations, and they just aren't there. Maybe they were traveling at the time of the census. Maybe the census taker was lazy and didn't want to get that last farm up the road or didn't know about it. Who knows. All I know is they aren't there. 4 males less then 5 (born between 1826 and 1830). 1 male 15 to 19 (born between 1821 and 1825). There is also a Melissa P Hill who in 1860 is 2 and living with Zillah's father and step-mother, and in 1860 is living with Zillah's sister. She is presumed to be the daughter of Zillah and James Hill. "Luke's grandfather Jimmie Hill came from North Carolina down to Banks County, and taught school two or three years. He married a Miss Pool, moved to Jackson Co. 2 miles from Gillsville toward Holly Springs. They had 11 children, 7 boys and 4 girls. George Lafayette was about the middle of this group. Dr. Pool at Lavonia is of the same Pool family." 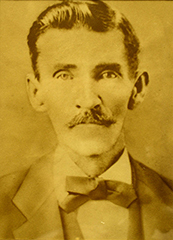 "Luther Jean Hill's father was George Lafayette Hill, born in Jackson Co in 1849, died in Madison Co in 1923. Floyd Hill is George Hill's older brother, went to Oglethorpe Co, was married twice and raised 2 families. Three of his children are Kalup, John & Ben Hill. Ben died young. Kalup was a policeman in Atlanta for years. 2 of George Hill's brothers went to Texas and were never heard from again. Nancy Hill is George Hill's sister." That's 4 boys, 3 girls, and 1 unknown. If the notes about the 11 children are correct, that leaves 1 girl and 3 boys about which we know nothing. If we assume J. R. Hill is male, that leaves 2 boys. I have not been able to learn anything about J. R. Hill or James H. Hill other then they were present in December 1868 for the sale of their deceased father's land. I know what happened with Floyd, Caleb, and George. That leaves two boys about which absolutely nothing is known. And it is likely that they are the two brothers who "went to Texas and were never heard from again." This is a really difficult mystery, compounded by the lack of information on this family in the 1850 census. The three or four boys born between 1826 and 1935 would have been between 15 and 24 years old, and this possibly still living with their parents, and we would know their names. The other thing is, just because they "went to Texas" doesn't mean they actually got there. They may have died along the way, or stopped in Alabama or Mississippi or Louisiana, or taken a right turn and ended up in Tennessee or Arkansas. But I'm always curious when I come across Hills from Texas. I try to trace their ancestry to see if it's possible they are descended from one of the two brothers. As I have mentioned elsewhere I had a Y-DNA test done, and found I belong to Group 6 on the HillDNA.Com website. Out of curiosity one day I did my own analysis on the HillDNA.Com data to see if there were any "unmatched" testers who were close to Group 6. I found one who isnoty really close by Y-DNA standards (genetic distance 5 when looking at 25 alleles), but who is closer to group 6 than to any other group. I contacted that person and found out he is descended from a William Robert Hill who showed up in Marshall, Texas in March 1887 when he married Hanna Golden. 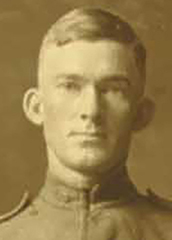 Their son George Randolph Hill was born in November 1887. Hanna divorced William Robert in 1891 for desertion. That's all we know about him, except for a photo. I asked his descendant to send me that photo, and I have to say there seems to be some family resemblance to my Hills. I have posted his photo here along with my great-grandfather George Lafayette Hill (born 1843, possibly WR Hill's uncle) and a second cousin once removed Orley Richmond Hill (born in 1896 and possibly WR Hill's first cousin once removed). 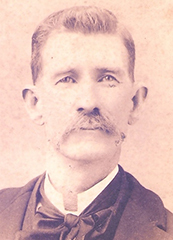 The photo of William Robert Hill looks like he's in his 20s or 30s, and since it was taken somewhere around 1890, that means he was probably born sometime between 1855 and 1865. That's too young to be one of the missing two brothers, but he could easily be the son of one of them. Again, the Y-DNA says he is not close enough to be related, but he's tantalizingly close, and the possible family resemblence sure makes it tempting to believe the Y-DNA could be wrong. Not likely, but still tempting.